Such a super turn out last week. I truly appreciate y'all joining my party. Sorry, if I didn't get by for a visit. I was a busy bee, getting ready for my two day garage sale that I had, and I also did a overhaul on my booth at Cotton City on Thursday. There were so many great links last week, it's hard to pick just a few. Now, let's see who got featured this week. 1. Please have a link to this party in the post or add my party button (you can find it under my header...my buttons). If there is no link you will not be featured and could be deleted. 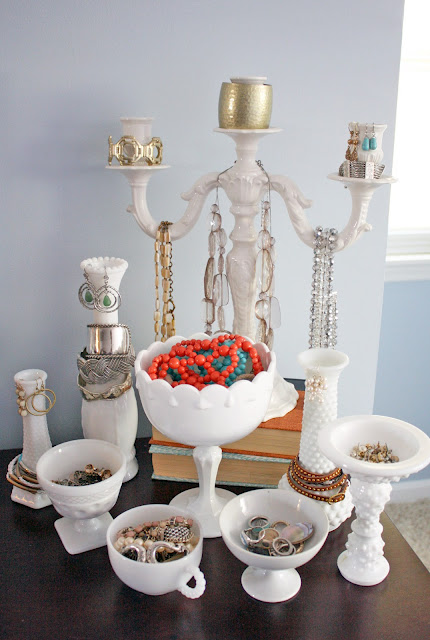 oh my gosh, that milkglass jewelry display is fabulous! what a neat idea, and one i could totally do if my cat wasn't so interested in things with beads or any other material she can bite off! Thanks as always for hosting such a great party, and the features are great. Also thanks for linking to my 1st blog anniversary party! Sweet features! Love that yellow cabinet. Thanks for hosting again! Linda, you always have the most inspiring features! I'm so honored that you included my yellow dresser this week. Thanks for hosting a great party! I'm loving painted furniture, so that yellow dresser is calling my name! Thanks for hosting. Beautiful features. Thanks for hosting. Hey Linda, oh I hear ya on the garage sales, wow, what a bunch of work! Just linked up, thanks so much for hosting, hope you have a great week! Thanks for hosting Linda! Now I see how I want to display my jewelry, love the white! All the features are wonderful! I love the little pin cushion. Too cute! I need one to help keep mine in check. Somehow they manage to get all over my floor and are hard to see! Wow! Thee are some beautiful ideas & presentations here. Love the yellow dresser & the milk glass display. Linda, there are always so many cute and wonderful things on your blog!! I love all the things posted!! Hope your garage sale was a big success. They're so much work, but it sure feels good to pass it all along to someone else. Great features Linda, I love all the milk glass. Thanks for hosting such a great party! I love your features, great inspiration! 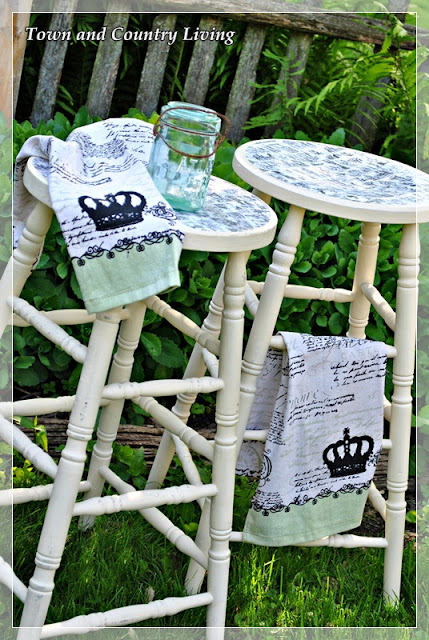 Hi Linda~ Thanks so much for featuring my decoupage stools! What a nice surprise. Thanks, too, for hosting! Hi, Linda! So happy to be partying with you. Thank you! Thanks for the party, Linda. Nice features. Thank you for hosting! Can't wait to browse around! 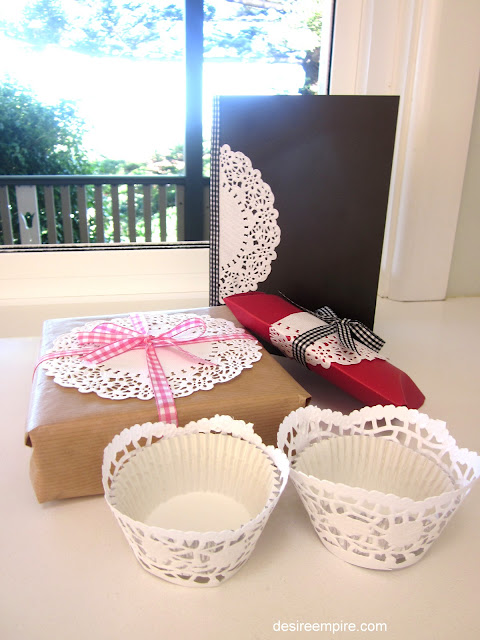 Thanks for featuring my doily craft. 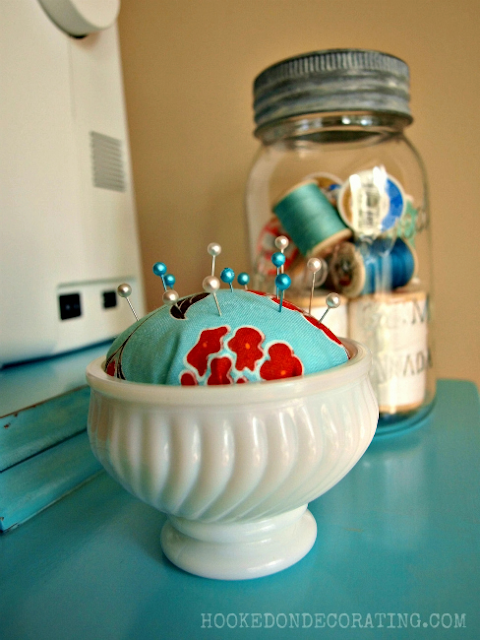 Thank you so much Linda for featuring my DIY pin cushion. I am honored! Looks like everyone's already all lined up for the party. Thank you for hosting! Hi Linda! Thanks for hosting! How did the garage sale go? We had a big 3-day one last year and cleared near a grand--- it was awesome!! It rained and nobody else opened up in the neighborhood except for us for the first few hours...we opened early anyway and seemed to get all the customers b/c people come out no matter what, esp. if you advertise. I hope you made good sales! They are a lot of work to prepare for... esp if you have a lot of clothes to wash to sell, but it is soooo worth clearing out the house and sellin some painted stuff, too! We can't have yard sales in our neigborhood, but the HOA is going to have a giant one in a parking lot outside the subdivison. I can't wait to get rid of some stuff! Looks like there are lots of good things at the party this week, as usual. Hey Linda! Was happy to post to your party but it looks like my link isn't showing up. Maybe I haven't given it enough time. Anyway, thanks for hosting as always! Thanks for hosting again this week. I'm heading off to check out the links! Hi Linda, thanks for hosting your wonderful party. I linked up the chair that I painted with the paint that I won on your blog! I love the color! Linda, Wonderful features and thanks for hosting. Love the picks, especially the jar of thread and the pincushion. Thanks for hosting. Thanks for hosting, great features too! Linda, love the milk glass! Thanks for the party! Thx for stopping by my blog today! I linked a thrifty project tonight. It's been so long since I blogged....blogger really looks different!! Hope you and your family are doing well. Linda wow look at all of these amazing entries!I look forward to visiting my fellow bloggers! !Thank you for having me..
Great features this week Linda and thanks for hosting! Late to the party again! : ) Thanks for hosting, Linda! I am obsessed with milk glass after inheriting some from my great aunt. Thanks for hosting! Love your features...I must try to make one of those pincushions! BTW, I just read your ironstone post and I have a question. Is ironstone marked with a certain mark or maker? Thanks for the party!!! great party! I think it's getting a lot bigger! Thanks for hosting! Fantastic features- thanks so much for hosting Linda!! I hope you had a GREAT garage sale. I just can't bring myself to do it. Ugh...so much work. Love the features and Love the party!!!! Garage Sales are exhausting and booth overhauls are too... How do you do it? You have some great features this week and it looks like another good party! Thank You! This is my first time joining in the fun. Thank you so much for hosting! Thanks for hosting! There are always so many good links here. Howdy! I've linked up a simple No Calorie Sweet Green Tea recipe (# 327 ) that's a great alternative to soda. Plus, it's tasty and it's good for you! Thanks for hosting the party and have a great day!